The past couple of months have been super busy and quite stressful. Instead of spending the summer doing – well summer things, I spent the summer building and selling homes. It was a complete world wind and completely unplanned. On a whim we decided to put out townhome in Decatur on the Market and search for a new home in the suburbs. When we bought the Decatur Townhome, we had no children and 1 dog – fast forward to 10 years later and we have 2 kids, 2 dogs and our needs changed drastically. We were now thinking about a larger home with more bedrooms, a yard and at the top of our list, a great school district. That meant that we were moving to the ‘burbs. Two years ago when I was out on the town on a regular basis, the thought of moving to the suburbs was suffocating, yet here we are living in the suburbs and I love it! We put our house on the market in June and spent the better part of the summer staging our home for viewings and running in and out several times daily for showings. We started house hunting simultaneously but settled on a new construction. We chose our home without ever seeing a finished model, I brought my husband to house with just frame and sheet rock and to an empty adjacent lot where we would build and somehow I was able to convince him that this should be our next home. The next couple of months were as stressful as expected, from passing on multiple offers to running into hiccups and miscommunication with the new build, blogging had taken a backseat until life had settled and there was some sense of normalcy. Here we are in the Fall, it’s been 3 weeks since we’ve moved into our new home and we are almost completely unpacked. Our townhome sold at the right time and everything fell into place so I’m ready to get back to my little space on the web! Today I’m sharing this recipe that I planned on sharing since the summer but alas, it never happened. 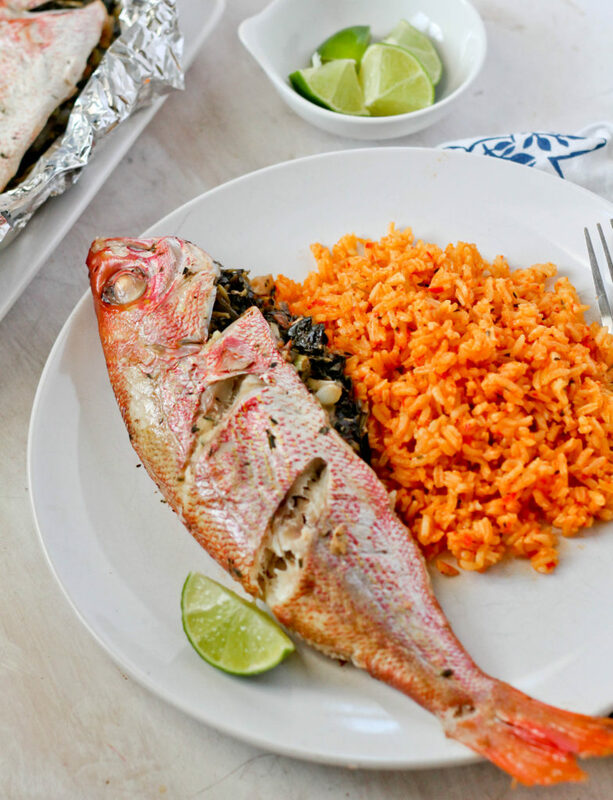 Even though the temperatures have cooled, I still think this is a great recipe to enjoy year round because it can be made on the grill or in an oven. Enjoy! 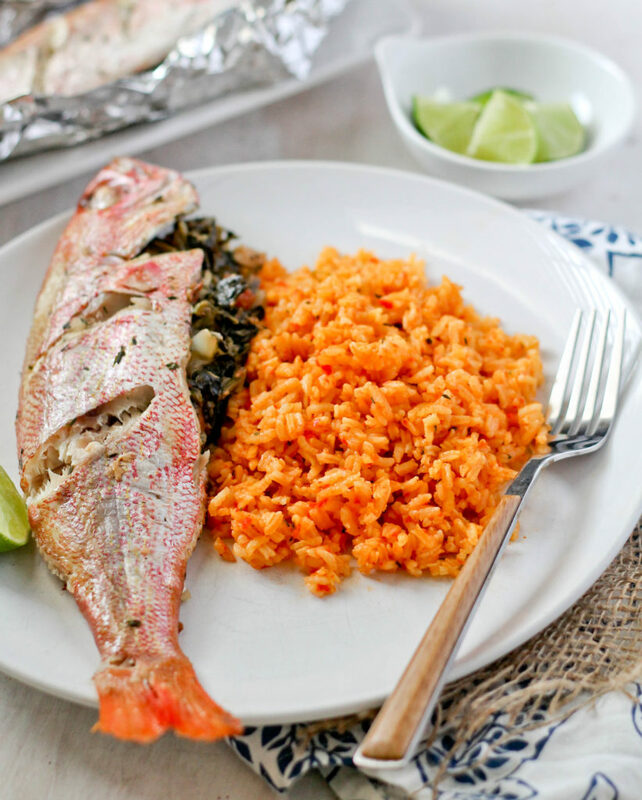 To prepare fish, slice the sides then place in a bowl with lime juice, salt and crushed garlic and coat well. Set aside. 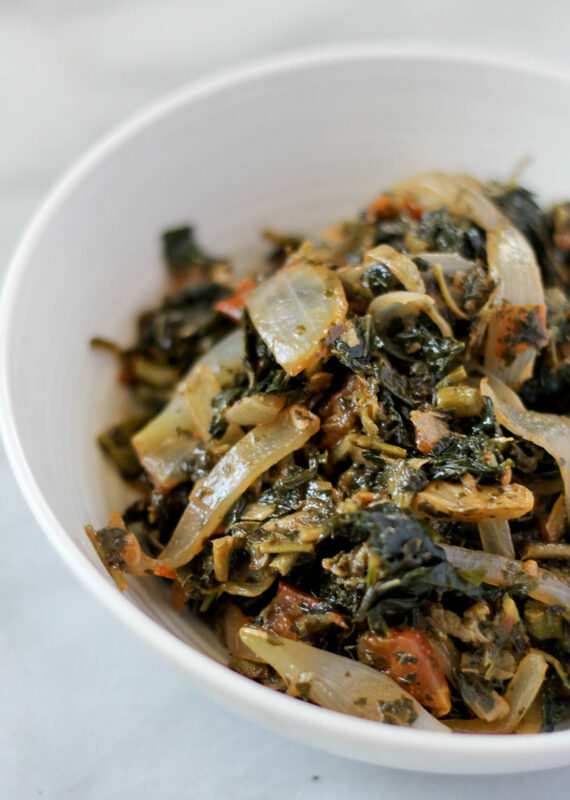 To make the callaloo, in a frying pan over high heat, add oil. When oil is hot add onion and sauté for 2 minutes, until its softened then add garlic and thyme; cook until the garlic is fragrant, about 30 seconds to a minute. Add tomatoes, salt, pepper and callaloo and sauté for about 10 minutes. Add 3 tbsp of water and cook for an additional 5-7 minutes until all the liquid has evaporated. Set aside and cool. 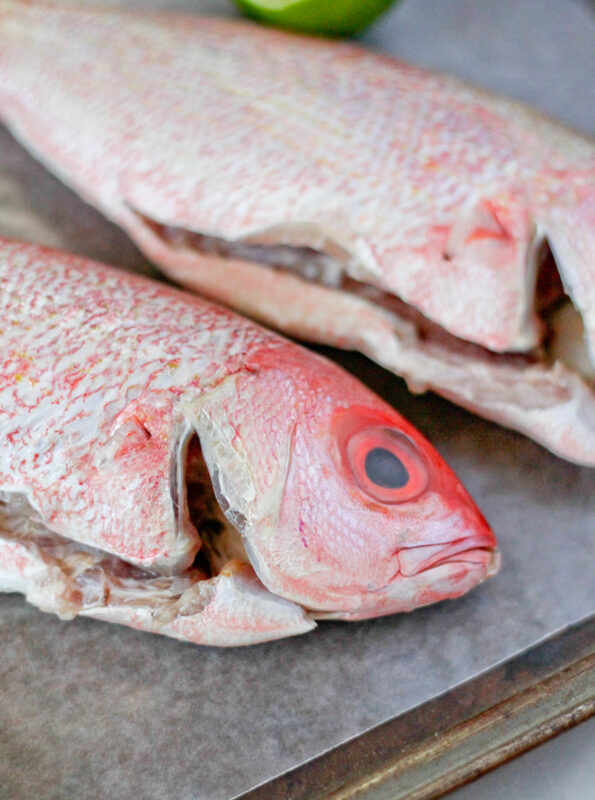 To roast the fish, preheat a grill or oven to 400 degrees. 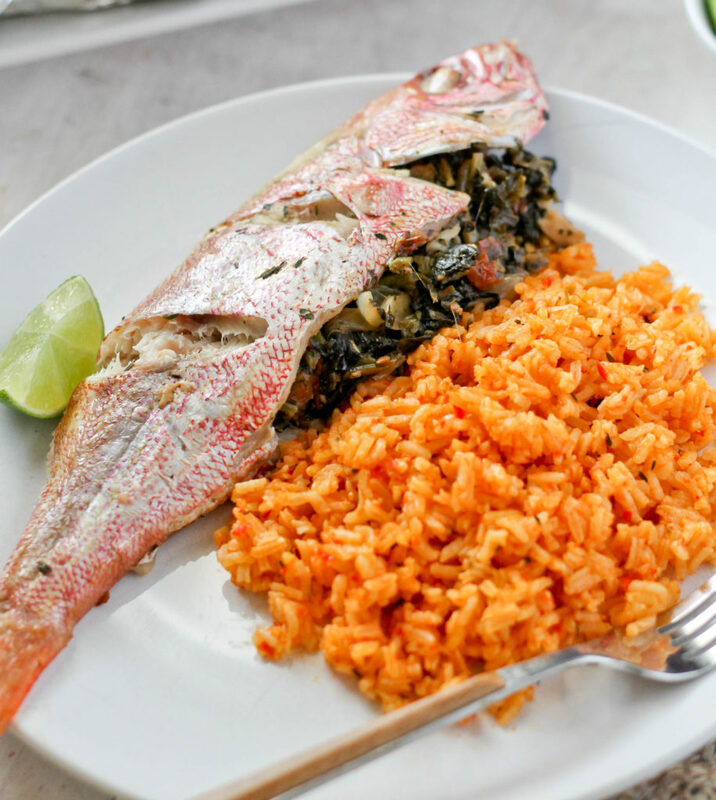 Place cooled callaloo stuffing into the cavity of the fish and wrap tightly with foil. If using a grill, place over indirect heat and grill for about 25 minutes. If using the oven, place on a large baking sheet and roast for 30-35 minutes. Allow to cool before unwrapping. Serve warm. Good to know! I”m in McDonough! This looks delicious. Do you have a recipe for the rice? Thanks, I will share it soon! It’s fairly easy.